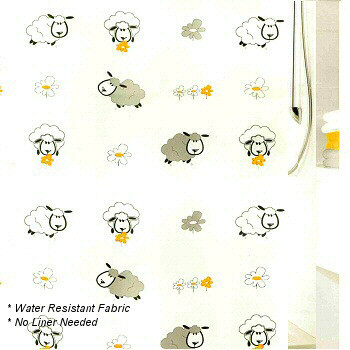 The Sheep shower curtain is designed and produced by well-known German brand Kleine Wolke, established in 1968, and is backed by their quality guarantee. A luxury, quick-dry and easy-care polyester fabric curtain, as used in many high-end hotels. This luxury shower curtain is great for bath time. White, medium grey and light grey playful sheep are have a fantastic time in the snowy white meadow which includes taking time to smell the yellow-orange, white and grey flowers.